Are you looking for a good MC novel? 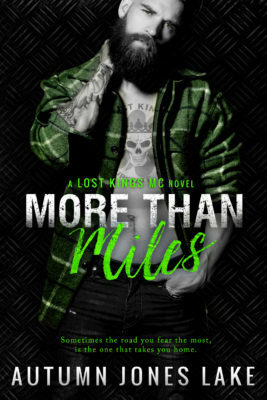 Autumn Jones Lake has you covered with More Than Miles, the next novel from the Lost Kings MC series! More Than Miles is finally here! Get all the details below and check out those pretty teasers, too! You can find Autumn on Facebook and she always loves to hear from readers at: AutumnJLake@gmail.com.